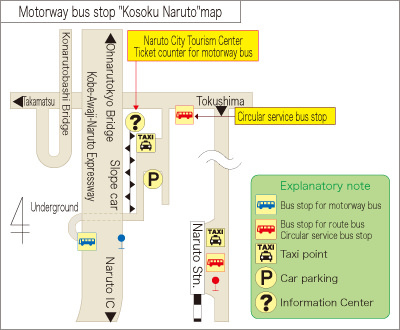 Tokushima Prefecture, on the eastern side of the island of Shikoku, is connected to mainland Japan by the Akashi-Kaikyo and Naruto Bridges, and can be reached from Osaka in two and a half hours by highway bus. 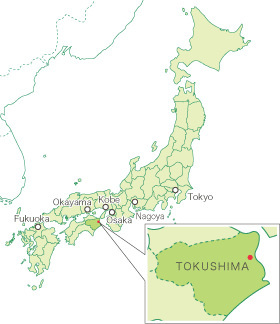 Tokushima is home of the world-famous Awa Dance festival and abounds in beautiful natural scenery. 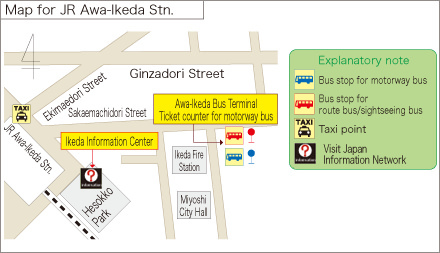 (Note)Symbols “A” and “B” for bus terminal shown in the map are different from actual-displayed information on the station map that uses numbers.